Thank you for visiting our registry! Joe and I are so excited to be bringing a beautiful baby boy into this world! Our little boy is already so lucky to be surrounded by so much love from friends and family! However, IF YOU MUST make him feel extra loved... here are some ideas of what this little man might need! 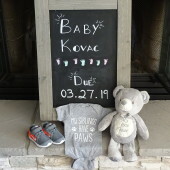 We love and appreciate all of you and cannot wait for you to meet Baby Boy Kovac!